Nalla Karam literally translates to ‘Black chili powder’ in Telugu. 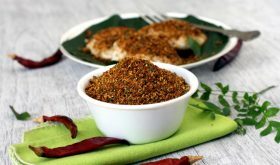 Andhra cuisine boasts of a variety of spiced powders like gun powder aka kandi podi, karam podi, sesame seeds powder, dry coconut powder and curry leaves powder. It is similar to Karam podi yet different in terms of looks, texture and flavor. 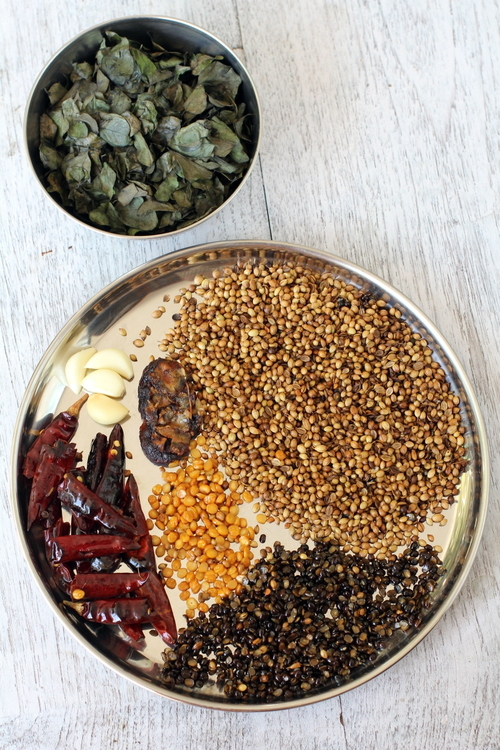 Each home has its own version of podis and over the years we have been trying out various permutations and combinations trying to achieve that ‘perfect podi’. Heat 1/2 tsp oil in a heavy bottomed vessel, add cumin seeds. Saute till brown and remove to a wide plate. In the same vessel, add 1/2 tsp oil. Once hot, reduce flame and add chana dal and roast till light brown. Remove to a plate. In the same vessel, add 1/2 tsp oil, add black gram dal and roast well till the color changes on low flame. Remove to a plate. In the same vessel, add 1/2 tsp oil, add red chilis and roast till dark in color and remove to a plate. In the same vessel, add 1/2 tsp oil, add coriander seeds and roast till color changes to a dark brown shade. Remove to a plate. In the same vessel, add 1/2 tsp oil, add curry leaves and saute till they change color. Do not burn them. Remove to a plate. In the same vessel, add 1/2 tsp oil, add tamarind and lightly roast it for a few seconds. Cool all the roasted ingredients. First grind the dals, red chilis, cumin and coriander seeds to a coarse powder. Add curry leaves and tamarind and grind for a few seconds. Do not grind too much. Finally add raw garlic and salt and grind for 10-15 seconds. It should be a coarse powder as shown in the picture above. Heat ghee in a vessel and add the coarsely ground powder to it and on very slow flame, roast the powder for 2 mts. Turn off flame and remove to a wide plate and cool. Store in an air tight container. 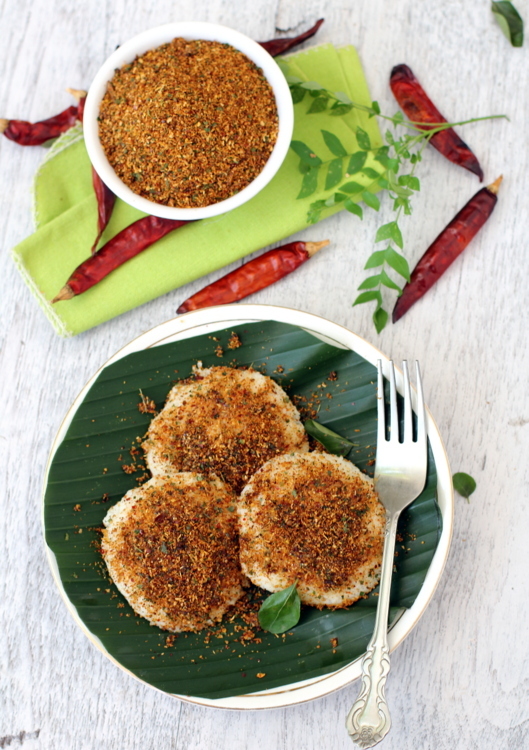 Serve as and when required with rice, idli and dosa. Do not over roast or burn the spices. Roast on low flame only. You can substitute tamarind with a tsp of dry mango powder. Curry leaves have to be washed and dried in the shade for a couple of hours before roasting them on low flame. By Sailu Published: August 26, 2013 Nalla Karam Podi, a typical Andhra style preparation similar to gun powder.Tamarind, garlic, red chilis & urad dal are key players of this tasty tangy podi. Sailu..meeru adhurs..:) Regular ga chesave ayina, somehow me way of presentation ela untundhi ante..ventane manam try cheyali..tinali..ane level..lo untai.. Yes, it will last long at room temperature. You can even refrigerate it for many weeks. Thank you Sailu. I shall prepare once my Chutney pudi is exhausted in my house. Im regular visitor of your blog finding good recepies. I’m new to cooking. Can you plz plz plz post the recipe of andhra style “karam” which they use instead of regular chillie powder. It tastes awesome. The recipe turnout delicious compared to regular chillie powder.My friend is using that which she bought from Vizag. I can see some crushed garlic flakes in that. If we use that there is no need to use the turmeric powder also seperatley. I’ll be waiting for the recipe. I searched online, but cant find. a big Plzzzzzzz for that recipe. Hello Sailu,GE.I am regularly visiting your web page to know about different varieties of food items.Thank you for the same. 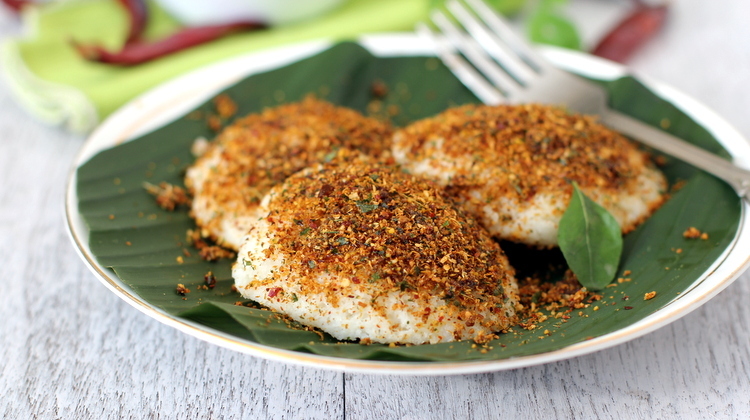 Could you please help me to know how to prepare Guntur Idli powder(Podi)which is being served in selected hotels in Chennai. It’s like sambar powder but with red colour and spicy.Hoping to hear from you soon. Hello , I tried this recipe yesterday and it came out beautifully, better than the store brought powder. Thank you for sharing ! !